Pawhuska , capital of the Osage Nation, attributes much of it's rich history and culture to the Osage tribe. The origins of the tribe date back to the Ice Age, though their link with Pawhuska began in 1871 when they bought this land back from the Cherokees. Pawhuska was named for a famous osage chief, Pahu-cka, or White Hair, who received his name from an incident in the battle known as St. Clair's Defeat. The chief, then a youth, wounded an officer wearing a powdered wig. As he started to scalp his quarry, the whole scalp came off and the victim escaped, leaving the Osage grasping a fluffy white wig in his hand! As perpetual owners of the mineral rights in the county, the Osage Indians became the richest people per capita in the world during the "Oil Boom" of the 1920's. Their fascinating history is chronicled in the Osage Tribal Museum, the oldest continually operating tribal museum in the United States. 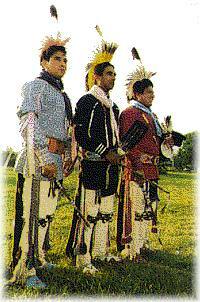 For a real expression of Osage culture, the Indian dances (I'n-Ion-Schks) are celebrated annually during June. Hear about Wild West outlaws such as Jesse James, Belle Starr, and Bill Doolin who hid out in the hills around Pawhuska (Bob Dalton was even the Osage Police Chief!) Many other famous people have had ties to Pawhuska: Herbert Hoover, Tom Mix, Clark Gable, Bob Wills, Ben Johnson, and more. Oil Barons such as Frank Phillips and Jean Paul Getty sat under the "Million Dollar Elm" in Pawhuska to bid for the Osage oil leases which helped make their fortunes. Or, would you believe that the first Boy Scout troop was founded in Pawhuska? (They camped out at Buckingham Palace and danced for the Queen!) These wild stories are all true; visit the Osage County Museum for information on these stories and more. Pawhuska's downtown is a grand tribute to it's past. It encompasses 98 buildings, 86 of which are listed on the National Register of Historic Places. Pawhuska's oldest building in the Blacksmith's Home, built in 1871 for the Osage Tribe's all-important blacksmith. The Constantine Theater, Built in the 1880's, was the life work of Mr. C. C. Constantine, who sought to establish it as the grandest playhouse in the southwest. Recently renovated by local citizens, it remains an acoustical and architectural masterpiece. City Hall is located in the building which was the first Osage Tribal Council House. The present stone building, built in 1894, is the second building, as the original was destroyed by fire. The bell in the tower was used to call councilmen to meetings. The County Courthouse building was completed in 1914. Osage County is the largest county in Oklahoma, twice as large as the entire state of Rhode Island and Delaware combined. Several monuments of interest have been erected on Cherokee Square surrounding the Capitol Building.